The Vrooman Mansion has a rich history as the longtime home of local native and socialite, Julia Vrooman. 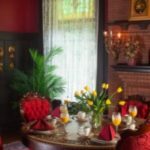 Originally built in 1869, it is an expansive Victorian house in the quiet Dimmitt’s Grove section of Bloomington, Illinois, and a stay here is always special. Like the rest of the home, the seven spacious guest rooms are beautifully decorated with a combination of period antiques and contemporary furnishings, each with a special theme tied in to the history of the house. Luxurious linens and robes pamper guests, as do features such as claw-foot tubs, marble walk-in showers, and restful sitting areas. Vrooman Mansion also has a romantic Carriage House with a stone wood-burning fireplace, heated floors, screened-in porch and two upstairs suites. Guests will find several luxurious common areas indoors for relaxing, including the Foyer, Music Room, Library, Parlor, and Safe Room study. Large porches and lovely grounds offer additional places to relax outdoors. Daily gourmet breakfasts are designed around seasonal ingredients, and feature savory and sweet entrees, such as BLT Eggs Benedict; Pecan Pumpkin Waffles; and a decadent French Toast topped with bananas, toffee, and caramel. The Vrooman Mansion offers a range of packages and themed getaways, and is a lovely setting for special events and weddings for up to 100 guests. For travelers who love staying in luxurious surroundings steeped in history, Vrooman Mansion is a perfect choice, conveniently located close to downtown Bloomington. Vrooman Mansion is a member of the Illinois Bed and Breakfast Association … a unique lodging experience! Photos are courtesy of IBBA. 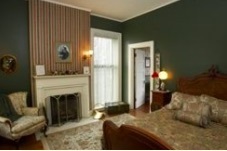 This entry was posted in Illinois Bed and Breakfasts and tagged Illinois Bed & Breakfasts by admin. Bookmark the permalink.